It’s time to Spring Forward. Sunday night, set your clocks ahead one hour. Modern Daylight Savings Time started in 1916. Germany initiated Sommerzeit, or Summer Time, to help conserve coal during World War I. Other European countries followed suit and the United States adopted Daylight Saving Time in 1918. 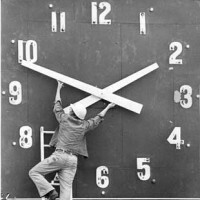 Although daylight saving time is considered to be correct, daylight savings time is commonly used.